with "Three Lines of Old French"
"BUT rich as was the war for surgical science," ended Hawtry, "opening up through mutilation and torture unexplored regions which the genius of man was quick to enter, and, entering, found ways to checkmate suffering and death —for always, my friend, the distillate from the blood of sacrifice is progress—great as all this was, the world tragedy has opened up still another region wherein even greater knowledge will be found. It was the clinic unsurpassed for the psychologist even more than for the surgeon." Latour, the great little French doctor, drew himself out of the depths of the big chair; the light from the fireplace fell ruddily upon his keen face. "That is true," he said. "Yes, that is true. There in the furnace the mind of man opened like a flower beneath a too glowing sun. Beaten about in that colossal tempest of primitive forces, caught in the chaos of energies both physical and psychical—which, although man himself was its creator, made of their maker a moth in a whirlwind—all those obscure, those mysterious factors of mind which men, for lack of knowledge, have named the soul, were stripped of their inhibitions and given power to appear. "How could it have been otherwise—when men and women, gripped by one shattering sorrow or joy, will manifest the hidden depths of spirit —how could it have been otherwise in that steadily maintained crescendo of emotion?" McAndrews spoke. "Just which psychological region do you mean, Hawtry?" he asked. There were four of us in front of the fireplace of the Science Club —Hawtry, who rules the chair of psychology in one of our greatest colleges, and whose name is an honored one throughout the world; Latour, an immortal of France; McAndrews, the famous American surgeon whose work during the war has written a new page in the shining book of science; and myself. These are not the names of the three, but they are as I have described them; and I am pledged to identify them no further. "I mean the field of suggestion," replied the psychologist. 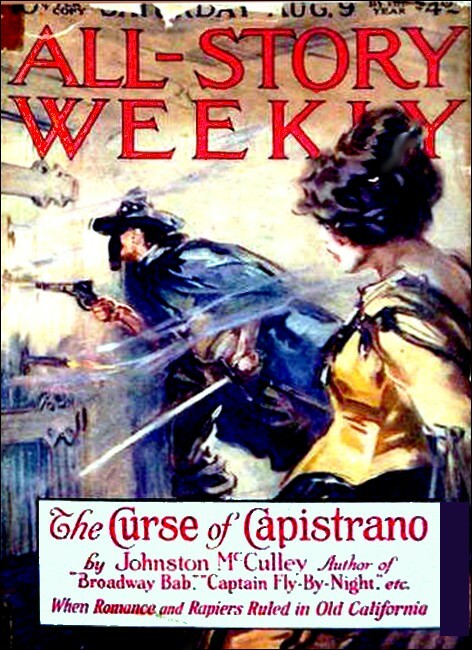 "The mental reactions which reveal themselves as visions—an accidental formation in the clouds that becomes to the overwrought imaginations of the beholders the so-eagerly- prayed-for hosts of Joan of Arc marching out from heaven; moonlight in the cloud rift that becomes to the besieged a fiery cross held by the hands of archangels; the despair and hope that are transformed into such a legend as the bowmen of Mons, ghostly archers who with their phantom shafts overwhelm the conquering enemy; wisps of cloud over No Man's Land that are translated by the tired eyes of those who peer out into the shape of the Son of Man himself walking sorrowfully among the dead. Signs, portents, and miracles, the hosts of premonitions, of apparitions of loved ones—all dwellers in this land of suggestion; all born of the tearing loose of the veils of the subconscious. Here, when even a thousandth part is gathered, will be work for the psychological analyst for twenty years." "And the boundaries of this region?" asked McAndrews. "Boundaries?" Hawtry plainly was perplexed. McAndrews for a moment was silent. Then he drew from his pocket a yellow slip of paper, a cablegram. "Young Peter Laveller died today," he said, apparently irrelevantly. "Died where he had set forth to pass—in the remnants of the trenches that cut through the ancient domain of the Seigneurs of Tocquelain, up near Bethune." "Died there!" Hawtry's astonishment was profound. "But I read that he had been brought home; that, indeed, he was one of your triumphs, McAndrews!" "I said he went there to die," repeated the surgeon slowly. So that explained the curious reticence of the Lavellers as to what had become of their soldier son—a secrecy which had puzzled the press for weeks. For young Peter Laveller was one of the nation's heroes. The only boy of old Peter Laveller—and neither is that the real name of the family, for, like the others, I may not reveal it—he was the heir to the grim old coal king's millions, and the secret, best loved pulse of his heart. Early in the war he had enlisted with the French. His father's influence might have abrogated the law of the French army that every man must start from the bottom up—I do not know—but young Peter would have none of it. Steady of purpose, burning with the white fire of the first Crusaders, he took his place in the ranks. Clean-cut, blue-eyed, standing six feet in his stocking feet, just twenty-five, a bit of a dreamer, perhaps, he was one to strike the imagination of the poilus, and they loved him. Twice was he wounded in the perilous days, and when America came into the war he was transferred to our expeditionary forces. 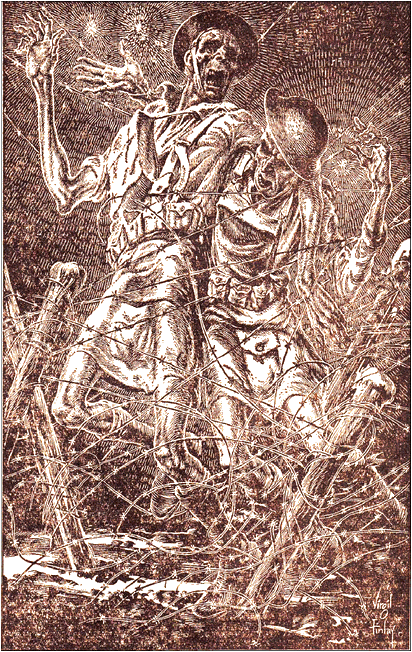 It was at the siege of Mount Kemmel that he received the wounds that brought him back to his father and sister. McAndrews had accompanied him overseas, I knew, and had patched him together—or so all thought. What had happened then—and why had Laveller gone back to France, to die, as McAndrews put it? He thrust the cablegram back into his pocket. "There is a boundary, John," he said to Hawtry. "Laveller's was a borderland case. I'm going to tell it to you." He hesitated. "I ought not to, maybe; and yet I have an idea that Peter would like it told; after all, he believed himself a discoverer." Again he paused; then definitely made up his mind, and turned to me. "Merritt, you may make use of this if you think it interesting enough. But if you do so decide, then change the names, and be sure to check description short of any possibility of ready identification. After all, it is what happened that is important—and those to whom it happened do not matter." I promised, and I have observed my pledge. I tell the story as he whom I call McAndrews reconstructed it for us there in the shadowed room, while we sat silent until he had ended. Laveller stood behind the parapet of a first-line trench. It was night —an early April night in northern France—and when that is said, all is said to those who have been there. Beside him was a trench periscope. His gun lay touching it. The periscope is practically useless at night; so through a slit in the sandbags he peered out over the three-hundred-foot-wide stretch of No Man's Land. Opposite him he knew that other eyes lay close to similar slits in the German parapet, watchful as his were for the least movement. There were grotesque heaps scattered about No Man's Land, and when the star-shells burst and flooded it with their glare these heaps seemed to stir to move—some to raise themselves, some to gesticulate, to protest. And this was very horrible, for those who moved under the lights were the dead—French and English, Prussian and Bavarian—dregs of a score of carryings to the red wine-press of war set up in this sector. There were two Jocks on the entanglements; kilted Scots, one colandered by machine-gun hail just as he was breaking through. The shock of the swift, manifold death had hurled his left arm about the neck of the comrade close beside him; and this man had been stricken within the same second. There they leaned, embracing—and as the star-shells flared and died, flared and died, they seemed to rock, to try to break from the wire, to dash forward, to return. seemed to rock, to try to break from the wire. 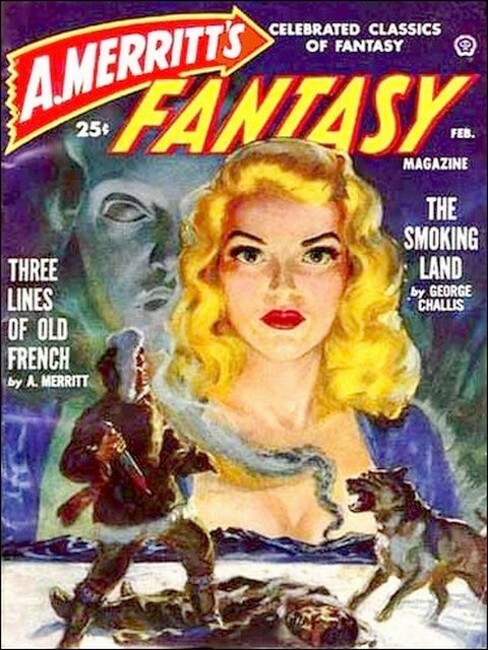 Illustration from "A. Merritt's Fantasy Magazine." Laveller was weary, weary beyond all understanding. The sector was a bad one and nervous. For almost seventy-two hours he had been without sleep —for the few minutes now and then of dead stupor broken by constant alarms was worse than sleep. The shelling had been well-nigh continuous, and the food scarce and perilous to get; three miles back through the fire they had been forced to go for it; no nearer than that could the ration dumps be brought. And constantly the parapets had to be rebuilt and the wires repaired —and when this was done the shells destroyed again, and once more the dreary routine had to be gone through; for the orders were to hold this sector at all costs. All that was left of Laveller's consciousness was concentrated in his eyes; only his seeing faculty lived. And sight, obeying the rigid, inexorable will commanding every reserve of vitality to concentrate on the duty at hand, was blind to everything except the strip before it that Laveller must watch until relieved. His body was numb; he could not feel the ground with his feet, and sometimes he seemed to be floating in air like—like the two Scots upon the wire! Why couldn't they be still? What right had men whose blood had drained away into a black stain beneath them to dance and pirouette to the rhythm of the flares? Damn them—why couldn't a shell drop down and bury them? There was a chateau half a mile up there to the right—at least it had been a chateau. Under it were deep cellars into which one could creep and sleep. He knew that, because ages ago, when first he had come into this part of the line, he had slept a night there. It would be like reentering paradise to crawl again into those cellars, out of the pitiless rain; sleep once more with a roof over his head. "I will sleep and sleep and sleep—and sleep and sleep and sleep," he told himself; then stiffened as at the slumber- compelling repetition of the word darkness began to gather before him. The star-shells flared and died, flared and died; the staccato of a machine gun reached him. He thought that it was his teeth chattering until his groping consciousness made him realize what it. really was—some nervous German riddling the interminable movement of the dead. There was a squidging of feet through the chalky mud. No need to look; they were friends, or they could not have passed the sentries at the angle of the traverse. Nevertheless, involuntarily, his eyes swept toward the sounds, took note of three cloaked figures regarding him. There were half a dozen of the lights floating overhead now, and by the gleams they cast into the trench he recognized the party. One of them was that famous surgeon who had come over from the base hospital at Bethune to see made the wounds he healed; the others were his major and his captain—all of them bound for those cellars, no doubt. Well, some had all the luck! Back went his eyes to the slit. "What's wrong?" It was the voice of the major addressing the visitor. "What's wrong—what's wrong—what's wrong?" The words repeated themselves swiftly, insistently, within his brain, over and over again, striving to waken it. Well, what was wrong? Nothing was wrong! Wasn't he, Laveller, there and watching? The tormented brain writhed angrily. Nothing was wrong—why didn't they go away and let him watch in peace? "Nothing." It was the surgeon—and again the words kept babbling in Laveller's ears, small, whispering, rapidly repeating themselves over and over; "Nothing—nothing—nothing—nothing." "Perfect case of what I've been telling you. This lad here—utterly worn, weary—all his consciousness centered upon just one thing —watchfulness... consciousness worn to finest point... behind it all his subconsciousness crowding to escape... consciousness will respond to only one stimulus—movement from without... but the subconsciousness, so close to the surface, held so lightly in leash... what will it do if that little thread is loosed... a perfect case." What were they talking about? Now they were whispering. "Then, if I have your permission—" It was the surgeon speaking again. Permission for what? Why didn't they go away and not bother him? Wasn't it hard enough just to watch without having to hear? Some thing passed before his eyes. He looked at it blindly, unrecognizing. His sight must be clouded. He raised a hand and brushed at his lids. Yes, it must have been his eyes —for it had gone. A little circle of light glowed against the parapet near his face. It was cast by a small flash. What were they looking for? A hand appeared in the circle, a hand with long, flexible fingers which held a piece of paper on which there was writing. Did they want him to read, too? Not only watch and hear—but read! He gathered himself together to protest. Before he could force his stiffened lips to move he felt the upper button of his greatcoat undone, a hand slipped through the opening and thrust something into his tunic pocket just above the heart. Someone whispered "Lucie de Tocquelain." What did it mean? That was not the password. There was a great singing in his head—as though he were sinking through water. What was that light that dazzled him even through his closed lids? Painfully he opened his eyes. Laveller looked straight into the disk of a golden sun slowly setting over a row of noble oaks. Blinded, he dropped his gaze. He was standing ankle-deep in soft, green grass, starred with small clumps of blue flowerets. Bees buzzed about in their chalices. Little yellow-winged butterflies hovered over them. A gentle breeze blew, warm and fragrant. Oddly he felt no sense of strangeness—then—this was a normal home world—a world as it ought to be. But he remembered that he had once been in another world, far, far unlike this; a place of misery and pain, of blood-stained mud and filth, of cold and wet; a world of cruelty, whose nights were tortured hells of glaring lights and fiery, slaying sounds, and tormented men who sought for rest and sleep and found none, and dead who danced. Where was it? Had there ever really been such a world? He was not sleepy now. He raised his hands and looked at them. They were grimed and cut and stained. He was wearing a greatcoat, wet, mud- bespattered, filthy. High boots were on his legs. Beside one dirt-incrusted foot lay a cluster of the blue flowerets, half- crushed. He groaned in pity, and bent, striving to raise the broken blossoms. "'Too many dead now—too many dead," he whispered; then paused. He had come from that nightmare world! How else in this happy, clean one could he be so unclean? Of course he had—but where was it? How had he made his way from it here? Ah, there had been a password—what had it been? He had it: "Lucie de Tocquelain!" Laveller cried it aloud—still kneeling. A soft little hand touched his cheek. A low, sweet-toned voice caressed his ears. "I am Lucie de Tocquelain," it said. "And the flowers will grow again —yet it is dear of you to sorrow for them." He sprang to his feet. Beside him stood a girl, a slender maid of eighteen, whose hair was a dusky cloud upon her proud little head and in whose great, brown eyes, resting upon his, tenderness and a half-amused pity dwelt. Peter stood silent, drinking her in—the low, broad, white forehead; the curved, red lips; the rounded, white shoulders, shining through the silken web of her scarf; the whole lithe sweet body of her in the clinging, quaintly fashioned gown, with its high, clasping girdle. She was fair enough; but to Peter's starved eyes she was more than that —she was a spring gushing from the arid desert, the first cool breeze of twilight over a heat-drenched isle, the first glimpse of paradise to a soul fresh risen from centuries of hell. And under the burning worship of his eyes her own dropped; a faint rose stained the white throat, crept to her dark hair. "I—I am the Demoiselle de Tocquelain, messire," she murmured. "And you—"
He recovered his courtesy with a shock. "Laveller—Peter Laveller —is my name, mademoiselle," he stammered. "Pardon my rudeness— but how I came here I know not—nor from whence, save that it was —it was a place unlike this. And you—you are so beautiful, mademoiselle!" The clear eyes raised themselves for a moment, a touch of roguishness in their depths, then dropped demurely once more—but the blush deepened. He watched her, all his awakening heart in his eyes; then perplexity awoke, touched him insistently. Two soft, warm hands gripped his. His tired head dropped upon them. Through the little palms that clasped so tightly pulsed rest and strength. The weariness gathered itself, began to withdraw slowly, so slowly— and was gone! In its wake followed an ineffable, an uncontrollable desire to weep —to weep in relief that the weariness had passed, that the devil world whose shadows still lingered in his mind was behind him, and that he was here with this maid. And his tears fell, bathing the little hands. Did he feel her head bent to his, her lips touch his hair? Peace came to him. He rose shamefacedly. "I do not know why I wept, mademoiselle—" he began; and then saw that her white fingers were clasped now in his blackened ones. He released them in sudden panic. "I am sorry," he stammered. "I ought not touch you—"
She reached out swiftly, took his hands again in hers, patted them half savagely. "I do not see them as you do, Messire Pierre," she answered. "And if I did, are not their stains to me as the stains from hearts of her brave sons on the gonfalons of France? Think no more of your stains save as decorations, messire." France—France? Why, that was the name of the world he had left behind; the world where men sought vainly for sleep, and the dead danced. The dead danced—what did that mean? He turned wistful eyes to her. And with a little cry of pity she clung to him for a moment. "You are so tired—and you are so hungry," she mourned. "And think no more, nor try to remember, messire, till you have eaten and drunk with us and rested for a space." They had turned. And now Laveller saw not far away a chateau. It was pinnacled and stately, serene in its gray stone and lordly with its spires and slender turrets thrust skyward from its crest like plumes flung high from some proud prince's helm. Hand in hand like children the Demoiselle de Tocquelain and Peter Laveller approached it over the greensward. "It is my home, messire," the girl said. "And there among the roses my mother awaits us. My father is away, and he will be sorrowful that he met you not, but you shall meet him when you return." He was to return, then? That meant he was not to stay. But where was he to go—whence was he to return? His mind groped blindly; cleared again. He was walking among roses; there were roses everywhere, great, fragrant, opened blooms of scarlets and of saffrons, of shell pinks and white; clusters and banks of them, climbing up the terraces, masking the base of the chateau with perfumed tide. And as he and the maid, still hand in hand, passed between them, they came to a table dressed with snowy napery and pale porcelains beneath a bower. A woman sat there. She was a little past the prime of life, Peter thought. 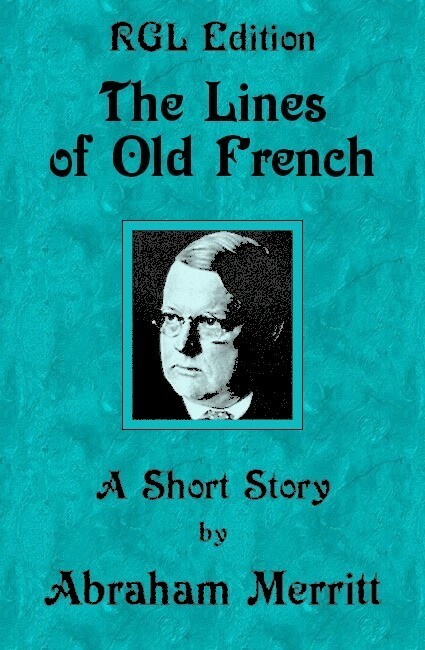 Her hair, he saw, was powdered white, her cheeks as pink and white as a child's, her eyes the sparkling brown of those of the demoiselle—and gracious—gracious, Peter thought, as some grande dame of old France. The demoiselle dropped her a low curtsy. "Ma mère," she said, "I bring you the Sieur Pierre la Vallière, a very brave and gallant gentleman who has come to visit us for a little while." The clear eyes of the older woman scanned him, searched him. Then the stately white head bowed, and over the table a delicate hand was stretched toward him. It was meant for him to kiss, he knew—but he hesitated awkwardly, miserably, looking at his begrimed own. "The Sieur Pierre will not see himself as we do," the girl said in half merry reproof; then she laughed, a caressing, golden chiming, "Ma mère, shall he see his hands as we do?" The white-haired woman smiled and nodded, her eyes kindly and, Laveller noted, with that same pity in them as had been in those of the demoiselle when first he had turned and beheld her. The girl touched Peter's eyes lightly, held his palms up before him —they were white and fine and clean and in some unfamiliar way beautiful! Again the indefinable amaze stifled him, but his breeding told. He conquered the sense of strangeness, bowed from the hips, took the dainty fingers of the stately lady in his, and raised them to his lips. She struck a silver bell. Through the roses came two tall men in livery, who took from Laveller his greatcoat. They were followed by four small black boys in gay scarlet slashed with gold. They bore silver platters on which were meat and fine white bread and cakes, fruit, and wine in tall crystal flagons. And Laveller remembered how hungry he was. But of that feast he remembered little—up to a certain point. He knows that he sat there filled with a happiness and content that surpassed the sum of happiness of all his twenty-five years. The mother spoke little, but the Demoiselle Lucie and Peter Laveller chattered and laughed like children—when they were not silent and drinking each the other in. And ever in Laveller's heart an adoration for this maid, met so perplexingly, grew—grew until it seemed that his heart could not hold his joy. Ever the maid's eyes as they rested on his were softer, more tender, filled with promise; and the proud face beneath the snowy hair became, as it watched them, the essence of that infinitely gentle sweetness that is the soul of the madonnas. At last the Demoiselle de Tocquelain, glancing up and meeting that gaze, blushed, cast down her long lashes, and hung her head; then raised her eyes bravely. "Are you content, my mother?" she asked gravely. "My daughter, I am well content," came the smiling answer. Swiftly followed the incredible, the terrible—in that scene of beauty and peace it was, said Laveller, like the flashing forth of a gorilla's paw upon a virgin's breast, a wail from deepest hell lancing through the song of angels. At his right, among the roses, a light began to gleam—a fitful, flaring light that glared and died, glared and died. In it were two shapes. One had an arm clasped about the neck of the other; they leaned embracing in the light, and as it waxed and waned they seemed to pirouette, to try to break from it, to dash forward, to return—to dance! A world where men sought rest and sleep, and could find neither, and where even the dead could find no rest, but must dance to the rhythm of the star-shells! He groaned; sprang to his feet; watched, quivering in every nerve. Girl and woman followed his rigid gaze; turned to him again with tear-filled, pitiful eyes. "It is nothing!" said the maid. "It is nothing! See—there is nothing there!" Once more she touched his lids; and the light and the swaying forms were gone. But now Laveller knew. Back into his consciousness rushed the full tide of memory—memory of the mud and the filth, the stenches, and the fiery, slaying sounds, the cruelty, the misery and the hatreds; memory of torn men and tormented dead; memory of whence he had come, the trenches. The trenches! He had fallen asleep, and all this was but a dream! He was sleeping at his post, while his comrades were trusting him to watch over them. And those two ghastly shapes among the roses—they were the two Scots on the wires summoning him back to his duty; beckoning, beckoning him to return. He must waken! He must waken! Desperately he strove to drive himself from his garden of illusion; to force himself back to that devil world which during this hour of enchantment had been to his mind only as a fog bank on a far horizon. And as he struggled, the brown-eyed maid and the snowy-tressed woman watched— with ineffable pity, tears falling. "The trenches!" gasped Laveller. "O God, wake me up! I must get back! O God, make me wake." "Am I only a dream, then, ma mie?" It was the Demoiselle Lucie's voice—a bit piteous, the golden tones shaken. "I must get back," he groaned—although at her question his heart seemed to die within him. "Let me wake!" "Am I a dream?" Now the voice was angry; the demoiselle drew close. "Am I not real?" A little foot stamped furiously on his, a little hand darted out, pinched him viciously close above his elbow. He felt the sting of the pain and rubbed it, gazing at her stupidly. "Am I a dream, think you?" she murmured, and, raising her palms, set them on his temples, bringing down his head until his eyes looked straight into hers. Laveller gazed—gazed down, down deep into their depths, lost himself in them, felt his heart rise like the spring from what he saw there. Her warm, sweet breath fanned his cheek; whatever this was, wherever he was —she was no dream! "But I must return—get back to my trench!" The soldier in him clung to the necessity. "My son"—it was the mother speaking now—"my son, you are in your trench." Laveller gazed at her, bewildered. His eyes swept the lovely scene about him. When he turned to her again it was with the look of a sorely perplexed child. She smiled. "Have no fear," she said. "Everything is well. You are in your trench —but your trench centuries ago; yes, twice a hundred years ago, counting time as you do—and as once we did." A chill ran through him. Were they mad? Was he mad? His arm slipped down over a soft shoulder; the touch steadied him. "And you?" he forced himself to ask. He caught a swift glance between the two, and in answer to some unspoken question the mother nodded. The Demoiselle Lucie pressed soft hands against Peter's face, looked again into his eyes. "Ma mie," she said gently, "we have been"—she hesitated —"what you call—dead—to your world these two hundred years!" But before she had spoken the words Laveller, I think, had sensed what was coming. And if for a fleeting instant he had felt a touch of ice in every vein, it vanished beneath the exaltation that raced through him, vanished as frost beneath a mist- scattering sun. For if this were true—why, then there was no such thing as death! And it was true! It was true! He knew it with a shining certainty that had upon it not the shadow of a shadow—but how much his desire to believe entered into this certainty who can tell? He looked at the chateau. Of course! It was that whose ruins loomed out of the darkness when the flares split the night—in whose cellars he had longed to sleep. Death—oh, the foolish, fearful hearts of men! —this death? This glorious place of peace and beauty? And this wondrous girl whose brown eyes were the keys of heart's desire! Death— he laughed and laughed again. Another thought struck him, swept through him like a torrent. He must get back, must get back to the trenches and tell them this great truth he had found. Why, he was like a traveler from a dying world who unwittingly stumbles upon a secret to turn that world dead to hope into a living heaven! There was no longer need for men to fear the splintering shell, the fire that seared them, the bullets, or the shining steel. What did they matter when this—this—was the truth? He must get back and tell them. Even those two Scots would lie still on the wires when he whispered this to them. But he forgot—they knew now. But they could not return to tell —as he could. He was wild with joy, exultant, lifted up to the skies, a demigod—the bearer of a truth that would free the devil-ridden world from its demons; a new Prometheus who bore back to mankind a more precious flame than had the old. "I must go!" he cried. "I must tell them! Show me how to return— swiftly!" A doubt assailed him; he pondered it. "But they may not believe me," he whispered. "No. I must show them proof. I must carry something back to prove this to them." The Lady of Tocquelain smiled. She lifted a little knife from the table and, reaching over to a rose-tree, cut from it a cluster of buds; thrust it toward his eager hand. Before he could grasp it the maid had taken it. "Wait!" she murmured. "I will give you another message." There was a quill and ink upon the table, and Peter wondered how they had come; he had not seen them before—but with so many wonders, what was this small one? There was a slip of paper in the Demoiselle Lucie's hand, too. She bent her little, dusky head and wrote; blew upon the paper, waved it in the air to dry; sighed, smiled at Peter, and wrapped it about the stem of the rosebud cluster; placed it on the table, and waved back Peter's questing hand. "Your coat," she said. "You'll need it—for now you must go back." She thrust his arms into the garment. She was laughing—but there were tears in the great, brown eyes; the red mouth was very wistful. Now the older woman arose, stretched out her hand again; Laveller bent over it, kissed it. "We shall be here waiting for you, my son," she said softly. "When it is time for you to—come back." He reached for the roses with the paper wrapped about their stem. The maid darted a hand over his, lifted them before he could touch them. 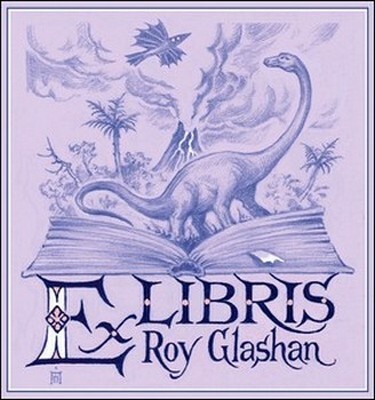 "You must not read it until you have gone," she said—and again the rose flame burned throat and cheeks. Hand in hand, like children, they sped over the greensward to where Peter had first met her. There they stopped, regarding each other gravely— and then that other miracle which had happened to Laveller and that he had forgotten in the shock of his wider realization called for utterance. "I love you!" whispered Peter Laveller to this living, long- dead Demoiselle de Tocquelain. She sighed, and was in his arms. "Oh, I know you do!" she cried. "I know you do, dear one—but I was so afraid you would go without telling me so." She raised her sweet lips, pressed them long to his, drew back. "I loved you from the moment I saw you standing here," she told him, "and I will be here waiting for you when you return. And now you must go, dear love of mine; but wait—"
He felt a hand steal into the pocket of his tunic, press something over his heart. "The messages," she said. "Take them. And remember—I will wait. I promise. I, Lucie de Tocquelain—"
There was a singing in his head. He opened his eyes. He was back in his trench, and in his ears still rang the name of the demoiselle, and over his heart he felt still the pressure of her hand. His head was half turned toward three men who were regarding him. One of them had a watch in his hand; it was the surgeon. Why was he looking at his watch? Had he been gone long? he wondered. Well, what did it matter, when he was the bearer of such a message? His weariness had gone; he was transformed, jubilant; his soul was shouting paeans. Forgetting discipline, he sprang toward the three. "There is no such thing as death!" he cried. "We must send this message along the lines—at once! At once, do you understand! Tell it to the world—I have proof—"
He stammered and choked in his eagerness. The three glanced at each other. His major lifted his electric flash, clicked it in Peter's face, started oddly—then quietly walked over and stood between the lad and his rifle. "Just get your breath a moment, my boy, and then tell us all about it," he said. They were devilishly unconcerned, were they not? Well, wait till they had heard what he had to tell them! And tell them Peter did, leaving out only what had passed between him and the demoiselle—for, after all, wasn't that their own personal affair? And gravely and silently they listened to him. But always the trouble deepened in his major's eyes as Laveller poured forth the story. "And then—I came back, came back as quickly as I could, to help us all; to lift us out of all this"—his hands swept out in a wide gesture of disgust—"for none of it matters! When we die—we live!" he ended. Upon the face of the man of science rested profound satisfaction. "A perfect demonstration; better than I could ever have hoped!" he spoke over Laveller's head to the major. "Great, how great is the imagination of man!" There was a tinge of awe in his voice. Imagination? Peter was cut to the sensitive, vibrant soul of him. They didn't believe him! He would show them! "But I have the proof!" he cried. He threw open his greatcoat, ran his hand into his tunic- pocket; his fingers closed over a bit of paper wrapped around a stem. Ah—now he would show them! He drew it out, thrust it toward them. "Look!" His voice was like a triumphal trumpet-call. What was the matter with them? Could they not see? Why did their eyes search his face instead of realizing what he was offering them? He looked at what he held—then, incredulous, brought it close to his own eyes, gazed and gazed, with a sound in his ears as though the universe were slipping away around him, with a heart that seemed to have forgotten to beat. For in his hand, stem wrapped in paper, was no fresh and fragrant rosebud cluster his brown-eyed demoiselle's mother had clipped for him in the garden. No—there was but a sprig of artificial buds, worn and torn and stained, faded and old! A great numbness crept over Peter. Dumbly he looked at the surgeon, at his captain, at the major whose face was now troubled indeed and somewhat stern. "What does it mean?" he muttered. Had it all been a dream? Was there no radiant Lucie—save in his own mind—no brown-eyed maid who loved him and whom he loved? The scientist stepped forward, took the worn little sprig from the relaxed grip. The bit of paper slipped off, remained in Peter's fingers. "You certainly deserve to know just what you've been through, my boy," the urbane, capable voice beat upon his dulled hearing, "after such a reaction as you have provided to our little experiment." He laughed pleasantly. Experiment? Experiment? A dull rage began to grow in Peter— vicious, slowly rising. "Monsieur!" called the major appealingly, somewhat warningly, it seemed, to his distinguished visitor. "Oh, by your leave, major," went on the great man, "here is a lad of high intelligence—of education, you could know that by the way he expressed himself—he will understand." The major was not a scientist—he was a Frenchman, human, and with an imagination of his own. He shrugged; but he moved a little closer to the resting rifle. "We had been discussing, your officers and I," the capable voice went on, "dreams that are the half-awakened mind's effort to explain some touch, some unfamiliar sound, or what not that has aroused it from its sleep. One is slumbering, say, and a window nearby is broken. The sleeper hears, the consciousness endeavors to learn—but it has given over its control to the subconscious. And this rises accommodatingly to its mate's assistance. But it is irresponsible, and it can express itself only in pictures. "It takes the sound and—well, weaves a little romance around it. It does its best to explain—alas! Its best is only a more or less fantastic lie—recognized as such by the consciousness the moment it becomes awake. "And the movement of the subconsciousness in this picture production is inconceivably rapid. It can depict in the fraction of a second a series of incidents that if actually lived would take hours—yes, days— of time. You follow me, do you not? Perhaps you recognize the experience I outline?" "Your officers disagreed with some of my conclusions. I saw you here, weary, concentrated upon the duty at hand, half in hypnosis from the strain and the steady flaring and dying of the lights. You offered a perfect clinical subject, a laboratory test unexcelled—"
"Steady, mon vieux"—it was his major whispering. Ah, when he struck, he must do it quickly—his officer was too close, too close. Still—he must keep his watch for him through the slit. He would be peering there, perhaps, when he, Peter, leaped. "And so"—the surgeon's tones were in his best student- clinic manner—"and so I took a little sprig of artificial flowers that I had found pressed between the leaves of an old missal I had picked up in the ruins of the chateau yonder. On a slip of paper I wrote a line of French —for then I thought you a French soldier. It was a simple line from the ballad of Aucassin and Nicolette—"
When all his days are run. "Also, there was a name written on the title-page of the missal, the name, no doubt, of its long-dead owner—'Lucie de Tocquelain'—"
Lucie! Peter's rage and hatred were beaten back by a great surge of longing—rushed back stronger than ever. "So I passed the sprig of flowers before your unseeing eyes; consciously unseeing, I mean, for it was certain your subconsciousness would take note of them. I showed you the line of writing—your subconsciousness absorbed this, too, with its suggestion of a love troth, a separation, an awaiting. I wrapped it about the stem of the sprig, I thrust them both into your pocket, and called the name of Lucie de Tocquelain into your ear. "The problem was what your other self would make of those four things —the ancient cluster, the suggestion in the line of writing, the touch, and the name—a fascinating problem, indeed! "And hardly had I withdrawn my hand, almost before my lips closed on the word I had whispered—you had turned to us shouting that there was no such thing as death, and pouring out, like one inspired, that remarkable story of yours—all, all built by your imagination from—"
But he got no further. The searing rage in Laveller had burst all bounds, had flared forth murderously and hurled him silently at the surgeon's throat. There were flashes of flame before his eyes—red, sparkling sheets of flame. He would die for it, but he would kill this cold-blooded fiend who could take a man out of hell, open up to him heaven, and then thrust him back into hell grown now a hundred times more cruel, with all hope dead in him for eternity. "It is nothing! It is nothing! See as I do!" He was standing between his officers, who held him fast on each side. They were silent, looking at the now white-faced surgeon with more than somewhat of cold, unfriendly sternness in their eyes. "My boy, my boy"—that scientist's poise was gone; his voice trembling, agitated. "I did not understand—I am sorry—I never thought you would take it so seriously." Laveller spoke to his officers—quietly. "It is over, sirs. You need not hold me." They looked at him, released him, patted him on the shoulder, fixed again their visitor with that same utter contempt. Laveller turned stumblingly to the parapet. His eyes were full of tears. Brain and heart and soul were nothing but a blind desolation, a waste utterly barren of hope or of even the ghost of the wish to hope. That message of his, the sacred truth that was to set the feet of a tormented world on the path to paradise—a dream. His Lucie, his brown-eyed demoiselle who had murmured her love for him —a thing compounded of a word, a touch, a writing, and an artificial flower! He could not, would not believe it. Why, he could feel still the touch of her soft lips on his, her warm body quivering in his arms. And she had said he would come back—and promised to wait for him. What was that in his hand? It was the paper that had wrapped the rosebuds —the cursed paper with which that cold devil had experimented with him. Laveller crumpled it savagely—raised it to hurl it at his feet. Someone seemed to stay his hand. The three men watching him saw a glory steal over his face, a radiance like that of a soul redeemed from endless torture. All its sorrow, its agony, was wiped out, leaving it a boy's once more. The major stepped forward, gently drew the paper from Laveller. There were many star-shells floating on high now, the trench was filled with their glare, and in their light he scanned the fragment. On his face when he raised it there was a great awe—and as they took it from him and read this same awe dropped down upon the others like a veil. Here is waking after dreaming. —She who loves you, Lucie." That was McAndrews's story, and it was Hawtry who finally broke the silence that followed his telling of it. "The lines had been on the paper, of course," he said; "they were probably faint, and your surgeon had not noticed them. It was drizzling, and the dampness brought them out." "No," answered McAndrews; "they had not been there." "But how can you be so sure?" remonstrated the Psychologist. "Because I was the surgeon," said McAndrews Quietly. "The paper was a page torn from my note book. When I wrapped it about the sprig it was blank —except for the line I myself had written there. "But there was one more bit of—well, shall we call it evidence, John?—the hand in which Laveller's message was penned was the hand in the missal in which I had found the flowers—and the signature 'Lucie' was that same signature, curve for curve and quaint, old-fashioned angle for angle." A longer silence fell, broken once more by Hawtry, abruptly. "What became of the paper?" he asked. "Was the ink analyzed? 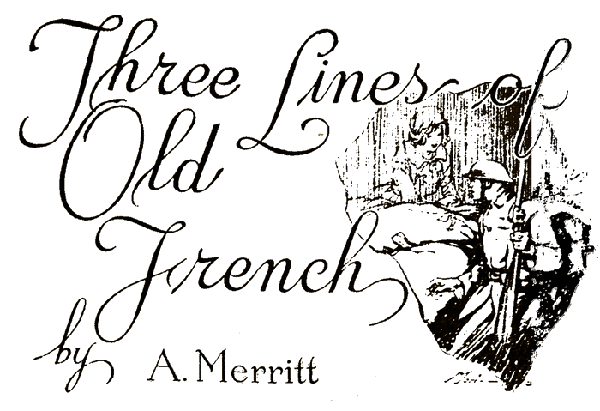 Was—"
"As we stood there wondering," interrupted McAndrews, "a squall swept down upon the trench. It tore the paper from my hand; carried it away. Laveller watched it go; made no effort to get it." "And that is all. He went through the war neither seeking death nor avoiding it. I loved him like a son. He would have died after that Mount Kemmel affair had it not been for me. He wanted to live long enough to bid his father and sister goodbye, and I—patched him up. He did it, and then set forth for the trench beneath the shadow of the ruined old chateau where his brown-eyed demoiselle had found him." "Because he thought that from there he could—go back—to her more quickly." "To me an absolutely unwarranted conclusion," said the psychologist, wholly irritated, half angry. "There is some simple, natural explanation of it all." "Of course, John," answered McAndrews soothingly—"of course there is. Tell us it, can't you?" But Hawtry, it seemed, could not offer any particulars.